Two on-screen texts: one fact and one fiction, offering views on how human life began. This resource presents two texts: one fact and one fiction, but both explain the same major event – how human life began. The resource can be used to stimulate argument and debate and provide opportunities for persuasive writing, in which children argue which text (if any) they believe or has most merit. The resource also provides an ideal chance to explore the two different genres. The fictional text is presented in a traditional story format, with illustrations. It is a retelling of an African folk tale called Mama Africa. The factual text is presented as a screen-by-screen presentation, with diagrams and photos. It is called What scientists believe. Ask the children how they think the world began. 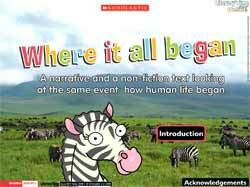 Elicit stories which attempt to explain how the world was created. Why are there so many different variations of this story? Discuss beliefs, drawing upon what the children have learned in RE. Consider whether any of the stories offer facts to suggest that the stories are true. Introduce the on-screen resource after eliciting that creation stories belong to the fictional genre. What sort of people might believe they can prove how the world began? Elicit scientists. Show the first screen. Ask the children to vote whether they prefer fiction or non-fiction, giving reasons for their preference. Explain that they will read and compare both texts but decide, as a class, which to read first.